Interactive Brokers as a GARP investment? When you look at a graph like that I think it’s pretty easy to justify a lofty multiple, but before we do that we should try to understand the business and the competitive landscape a bit better. 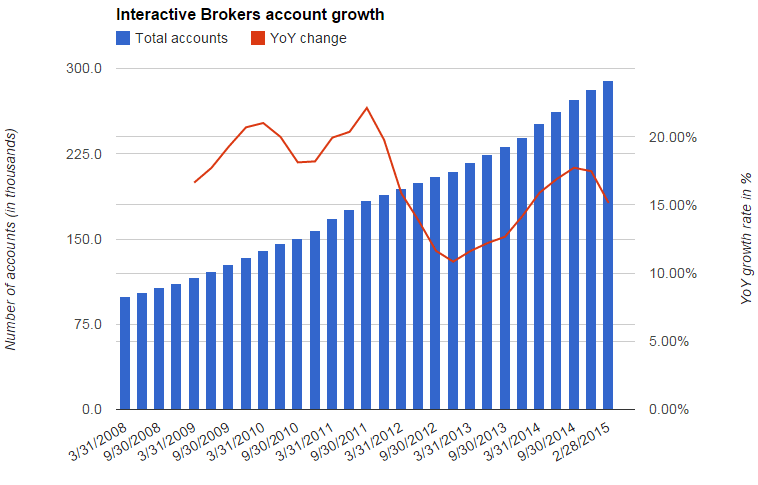 The first thing to realize is that Interactive Brokers is, despite their awesomeness, not a broker for everybody. They target sophisticated investors who already have significant experience, are more active than average and have more money than average. What they offer are, among other things, lower fees and better trade execution. For the past twelve months, IB reported that their customers average total trading cost was 1.2 basis points of trade value compared to daily VWAP (I’m sure you know this, but it’s worth emphasizing: one basis point is one one-hundredth of one percentage point!). Other brokers don’t disclose this statistic, and presumably for good reasons since they not only charge higher fees but also execute trades at worse prices. IB can offer lower costs because of their superior technology that allows them to automate many aspects of their business. Technology is also part of the reason why they are able to execute trades at better prices: their order routing is better, and they don’t sell their customers order flow to internalizers. They also pass-through exchange rebates to customers which reduces the incentive to route customer orders to exchanges with a high rebate – that the broker can pocket – at the expense of price and/or fill rate. Another good thing about their business model is that IB attracts the most valuable customers. Most electronic brokers have to spend a significant amount of money on advertising to attract customers, and most customers that they attract are small accounts from inexperienced investors. These accounts are not very profitable (if at all) because they usually don’t generate a lot of trading commissions and they do place a heavy load on the customer support department. I couldn’t find the source, but I do remember hearing that Binck – the biggest online broker in the Netherlands – is generating more than 80% of its revenues from just 0.1% of its customers. I think that’s bad news for Binck because exactly those large and active accounts can presumably gain a lot by switching to Interactive Brokers. While IB’s fixed cost base is without a doubt higher than Binck’s their strengths are basically Binck weaknesses. They do have economies of scale and because of the rapid growth in customer accounts this competitive edge is only getting bigger. At the same time, they have an offering that is especially well tailored to the most valuable customers of other brokers. Binck’s risk is Interactive Brokers opportunity. What we see here is that IB has rapidly taken a large part of the pie, and for a good reason because IB offers margin loans at rates that are a magnitude lower than the competition. Customers that use margin are presumably predominantly the more sophisticated active traders. At the same time, this data point is not good news with regards to IB’s growth prospects since it seems that they have already managed to grab decent market share in the US. Tripple IB’s size and they have 100% of this market: that’s never going to happen. All I can tell you is that I am surprised that it’s not ramping up faster. So I think that next year will be over 20%. That’s what I think. Well, if you really want to know my honest opinion, I think that in 10 years we could be the biggest broker in the world, and I am not kidding, because our technology is way out ahead. It makes sense that the average number of daily trades is way more volatile than the number of accounts since it depends heavily on market volatility: clients don’t trade if nothing is happening in the market. 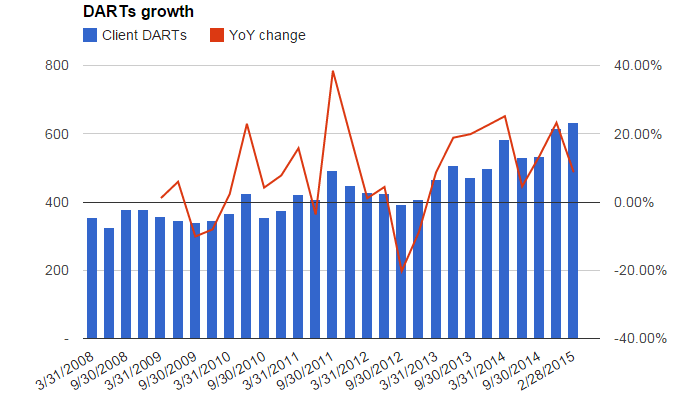 But I do think it is telling that DARTs have grown at a CAGR of 8.8% since 2008 versus an account growth rate of 16.8%. I think that many of the most active traders have already made the switch to IB years ago: a lot of the low-hanging fruit has been picked. The second major component of IB’s income is interest income and this source of revenue is better correlated to the number of accounts since IB’s customers use roughly 30% margin as percentage of their equity. Thanks to rising markets IB’s customers have steadily increased their average equity per account. Of course, there is a risk that a new crisis can undo all these gains. In 2014 approximately 56% of brokerage revenue consisted of commissions, 36% interest income and 8% other. The publicly traded stock is just a small part of the whole company, the remainder is still owned by Thomas Peterffy. The current market cap of the whole company is $13.6 billion, but this also included a market making unit with a book value of $1,036 million that consists of liquid securities. The market making unit is still generating a solid profit, but is at the same time struggling a bit in recent years because of competition from high-frequency traders. Simply valuing the market making business at book value is reasonable I think. So that leaves us with a $12.6 billion value for the brokerage business, a segment that managed to generate $588.5 million in pretax earnings last year. 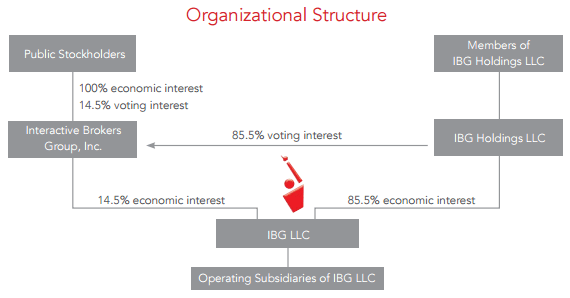 IB is currently paying a tax rate of less than 10%, but as far as I understand that is caused by the fact that the company doesn’t recognize the tax payable by the IBG LLC partnership. 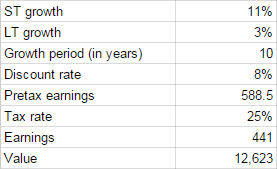 Accounting for the fact that IB does a lot of business in foreign countries with a low tax rate, I think that using a 25% rate is reasonable. It’s a very simple model, but I think these growth assumptions aren’t very aggressive nor is an 8% discount rate very low in today’s interest rate environment. The model also doesn’t account for operating leverage that is presumably present in IB’s business model. 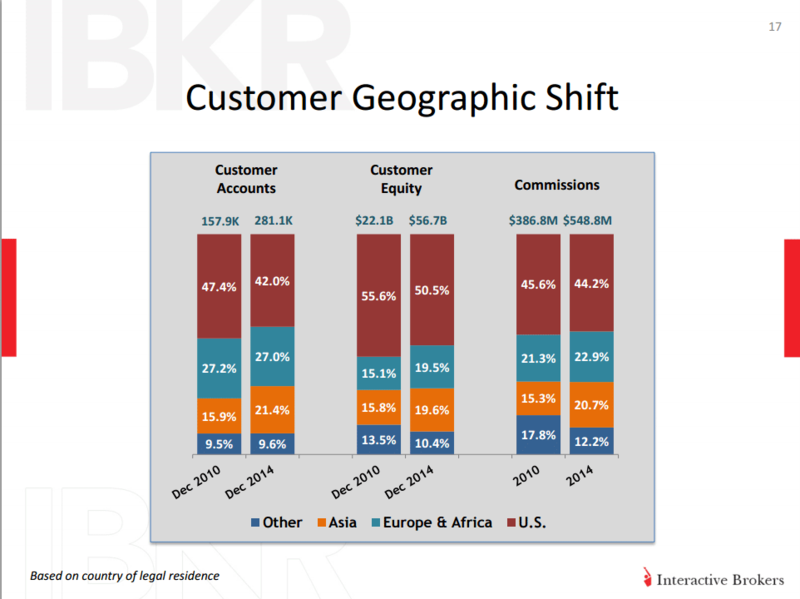 IBKR is probably an interesting stock for people who specialize in buying growth at a reasonable price. The stock is not cheap, but you also don’t have to envision some extreme sky-is-the-limit story to justify the current price. One interesting question to ask yourself when you consider investing in IBKR: what’s your edge versus fellow investors? There are going to be a lot of smart investors who use the broker, understand their business model and know firsthand how they compare to the competition. 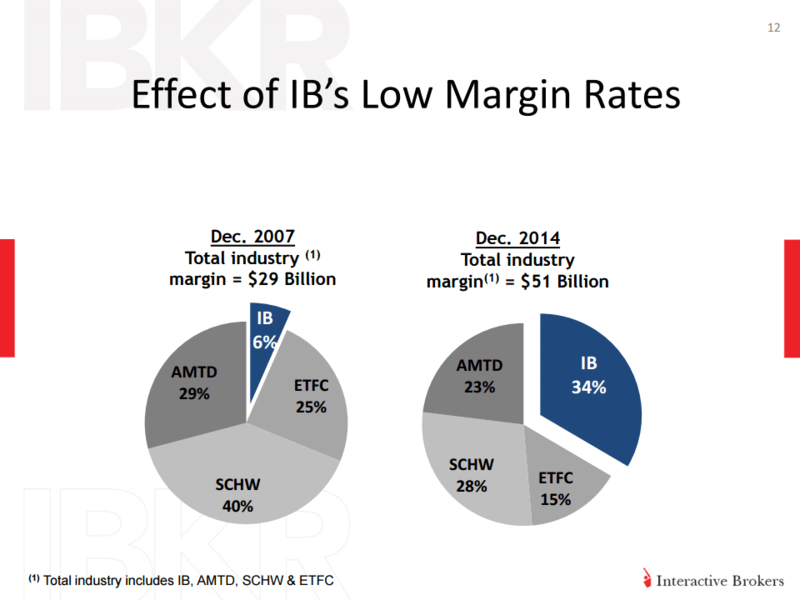 IBKR isn’t some obscure stock that no-one knows about. This entry was posted in Research and tagged IBKR on March 27, 2015 by Alpha Vulture.